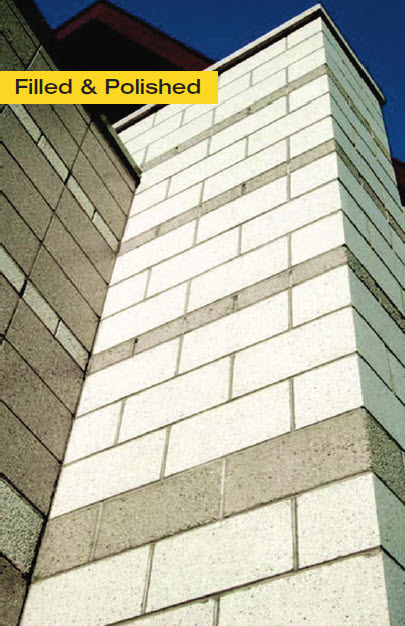 Architectural concrete masonry units (CMU) allow the architect to design a structural wall with finished surfaces that can be easily installed in one step. Both faces of the CMU can be produced with different textures. Industry optimization of mix designs, pigments and admixtures really help to enhance these products that are commonly referred to as architectural concrete masonry units (CMU). Forward-thinking manufacturers realized that original standard grey block could be made in color, various shapes and textures. Early architectural masonry finishes were simply integrally pigmented CMU using existing molds and machinery. Scores were added to give a different perceived scale or look to the masonry while using full size units for construction of the masonry. Once commodity, durable grey block were painted for variety in finish application, when visible. Today, raw grey textural is making a new fashion statement, pigmented to any shade of grey to achieve the new style of natural in the texture of choice. Pigments and molds give CMU a whole new look. 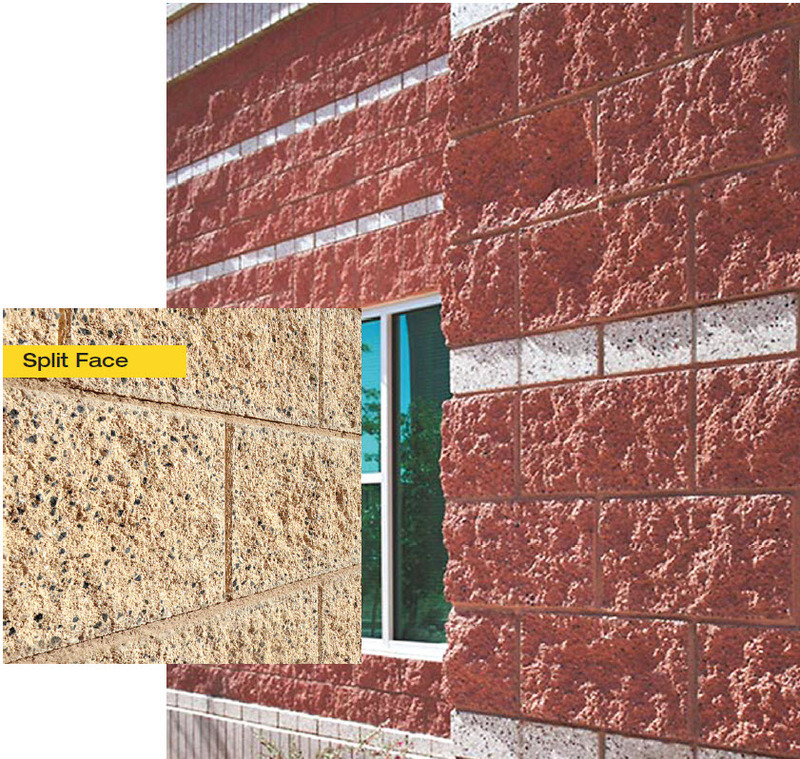 Split Face and Ribbed Block: Around the 1950s, manufacturers developed split face masonry units. Split Face CMU could be manufactured with the addition of a splitting machine and specialty mold parts. These are integrally colored (or paintable if desired) with a beautiful, rough-hewn texture on one or more faces. Units are molded as two units face to face. They are then mechanically split apart after curing, leaving the split face with a rough texture similar to natural stone. The splitting process reveals aggregates used in the mix, so various sizes and colored aggregates will give different appearances. No two units are exactly alike. 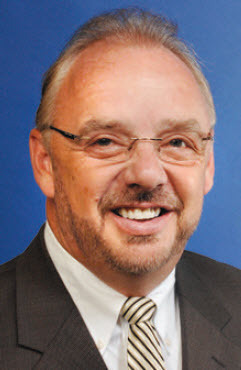 Options for Split-Face CMU may also be scored, half-high brick-sized units. Split can be very rough or mildly textured. By the 1970s, Split Face units eventually evolved into ribbed or fluted finish textures. These architectural masonry units featured 4, 6 or 8 vertical ribs that when installed, give continuous vertical feature to the finished wall. Other options for this unit are a smooth molded look. 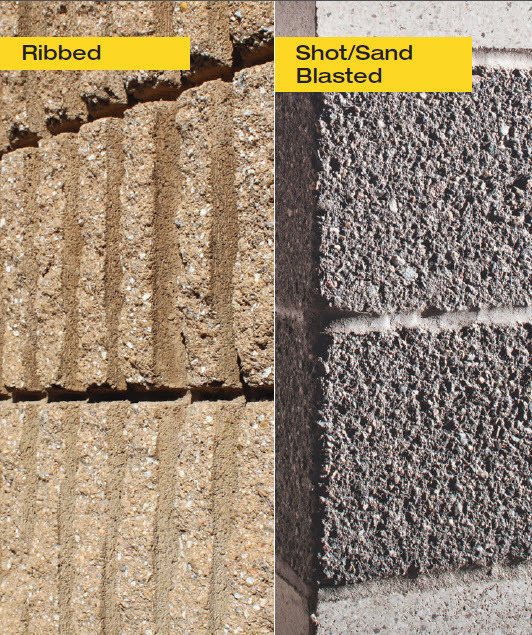 Shot/Sand Blasted: Pigmented block are subjected to a blasting process using either small pellets or sand as a medium. The process produces a finish that leaves larger aggregate in place while the smaller fines are removed. Weathered or textured units resemble Split Face block but are more uniform, easier to lay and provide straighter site lines to a building. Ground Face/Burnished accepts pigment. Aggregate does not, allowing it to be a focal point, a design element in a burnished unit. Aggregate is selected for color, size & shape. Ground Face or Burnished:Ground or burnished face unit appeared at the turn of this century. 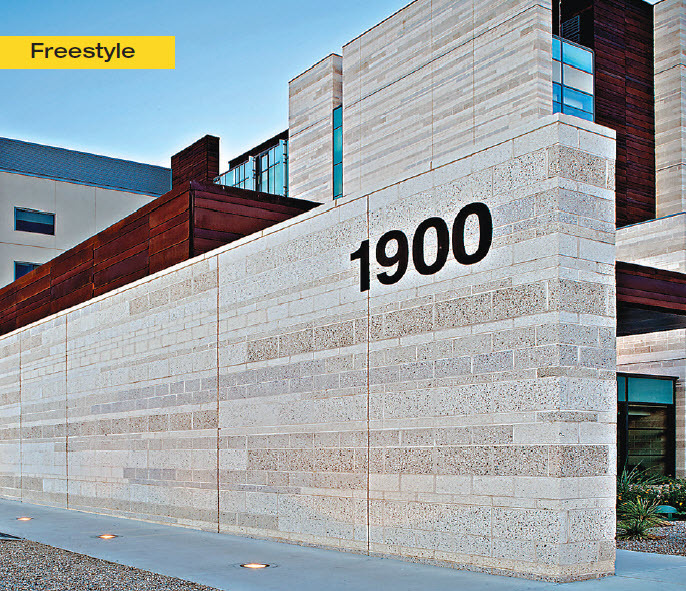 Pre-finished integrally pigmented concrete block incorporates contrasting aggregates that are exposed through a grinding process to reveal a smooth exposed finish resembling honed or polished stone. Manufacturers offer variations of this product. Burnished Standard is the ground or burnished finished that uses a clear acrylic to accentuate the natural beauty of the aggregates and to enhance moisture resistance. Ground, filled and highly polished. Filled and Polished Face. A ground unit face is filled with a cementitious grout that fills its pores, then goes through a polishing machine. After the application of an acrylic sealer, the finished product resembles the look of smooth terrazzo. Reflective. 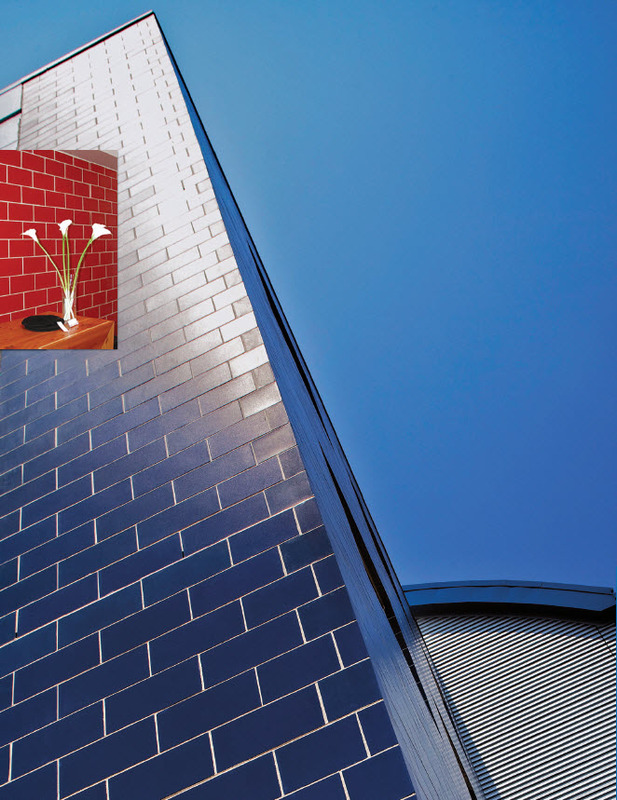 Polished reflective architectural masonry unit is a highly-dense colored concrete block receiving multiple grindings and polishings which produce a very smooth reflective finish. The final shine or luster resembles polished granite or marble. All offer the architect a prefinished product that can be used as a veneer or structural loadbearing design. 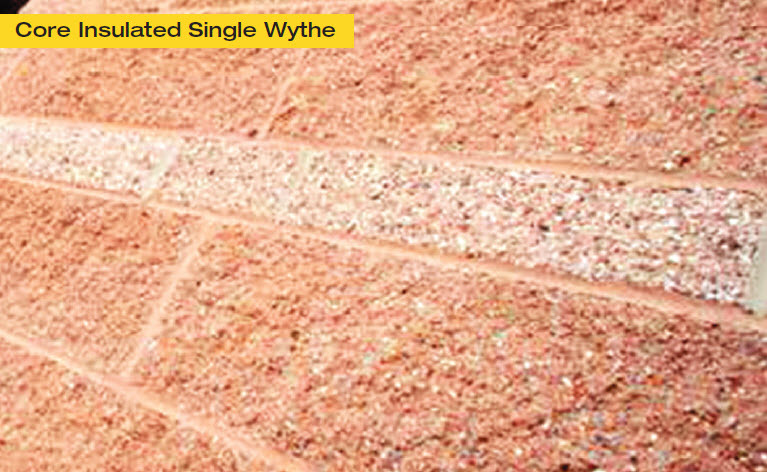 Core insulated single wythe energy performance soft red split face 6x8x24 CMU banded with sand shot blast CMU in varying lengths. Insulated block may be designed in any pigmented texture of choice using interior cores with insulation to optimize energy performance. Variegated Color: Concrete units are manufactured using multiple colors either in the mix or sprayed on during the mold process. 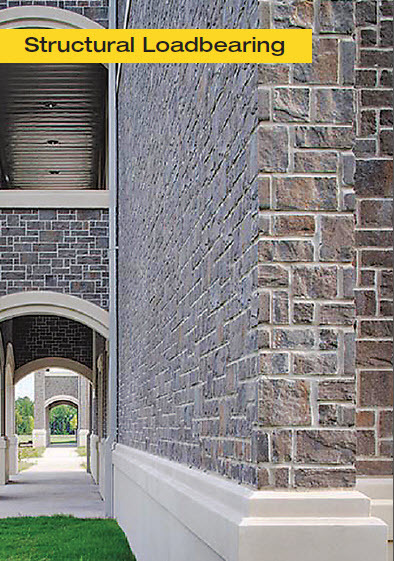 The finished look gives a rich look of clay brick masonry with its random shades and colors. 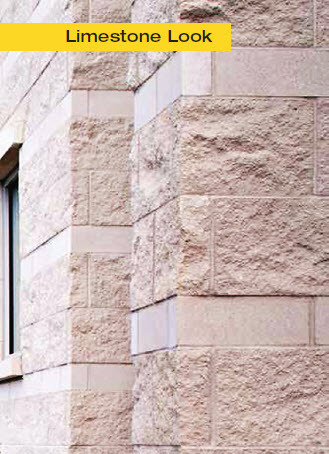 Face size of these CMU can be produced in a size and scale that gives the masonry the look of traditional clay masonry along with the performance and economy of concrete masonry. 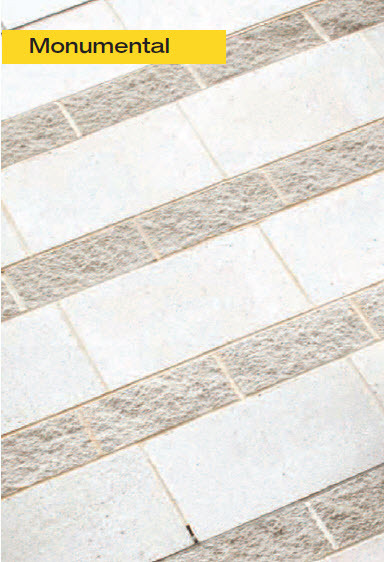 Architectural Stone: Some of the latest trends in architectural finishes emulate the look of natural hand cut stone. Through the use of multiple color blending, a mixture of sizes and textures, today’s state-of-the-art manufacturing plant offers a durable product that closely resembles natural stone and can be installed at an economical cost. These products can either be installed as a traditional full bed depth product or as an adhered thin set veneer. May be designed in any color and texture as a structural loadbearing masonry building enclosure. 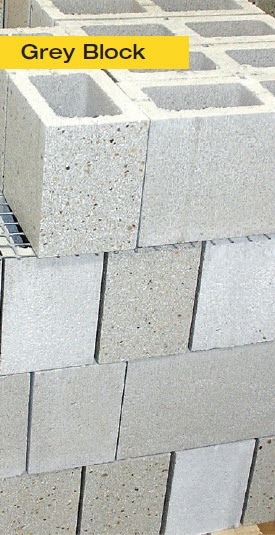 Grey ashlar pattern shown here. 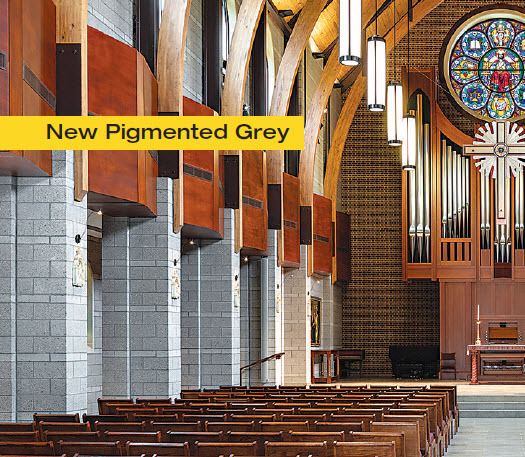 These are some of the more architectural concrete masonry finishes available for today’s architect. There are however, other designer products in the market that feature unique textures or shapes. Screen block, a staple of the Mid-Century desert southwest still has a following today, as does the double diamond with its pyramid-shaped projection and combed-face and scored. 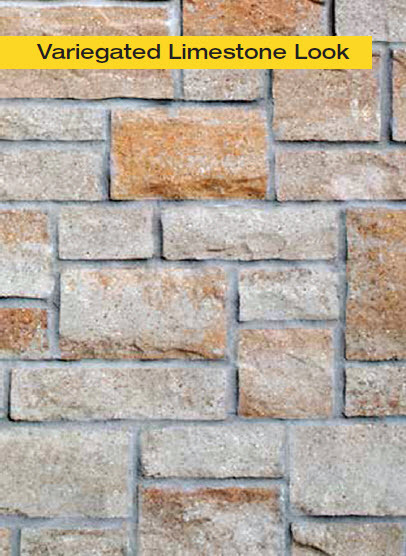 The beauty of the variety of product offered by our industry is that architectural masonry can provide economical, fire resistant, durable and energy efficient prefinished architectural concrete masonry units that can be used as a veneer or structural unit. 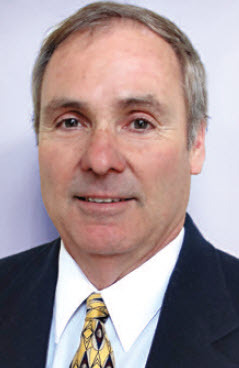 Given these attributes, owners will find true value when combining these factors with the pleasing aesthetics offered. Full bed and half-high units, split, smooth and textural, pigmented for effect. Red flashed half-high unit with base of 8" high off-white split face and white smooth accent. Brown split banded with smooth in doorway. Glazed Block can be manufactured as veneer or structural load-bearing units that comply with ASTM C90. This architectural unit is pre-faced with a thermoset glazing compound permanently molded on one or more faces. In addition to C90, units must also comply with ASTM C744 which contains minimum requirements for face quality and dimensional tolerances. An integral part of the unit, faces have dimensional uniformity regardless of minor variations in the block. Glazed face units are often selected for commercial, retail, institutional and industrial applications with their impervious surface, flexible design options and recycled content.